The origin of the band Tiny Tornado comes from the creative energies of two prolific performers and songwriters, Jade Ell and Mats Hedstrôm. Melding their creative energy, they released Tiny Tornado: Echoes and Rhymes, a release with 12 original tracks that weaves pop, rock, folk and more with captivating lyrics that tell a story carrying the listener on a musical journey. Personnel: Alexandra Ekelöf - violin on Paperplane and 86 400, Emeli Jeremias - cello on I'm All Poison. All other instruments: Tiny Tornado (Jade Ell and Mats Hedstrôm). Tiny Tornado - Echoes and Rhymes features 12 songs written by Jade Ell and Mats Hedstrôm and was recorded at Joy Vision Studio in Stockholm, Sweden, and released on the Tiny Tornado label. This is the debut release for the band Tiny Tornado, but for the creative forces behind this release, Jade Ell and Mats Hedstrôm, who have been writing songs together for more than 10 years, and who have countless solo releases and other band collaborations between them, they decided that it was time to take their collaborative genius and lay down the tracks on their own album. To read reviews of other Jade Ell releases see the Music Scene section and Jade Ell - Methods (of a hostage negotiator) and Jade Ell - Ellen, Mourning this Morning. The release opens with the track 86 400 and a nice guitar riff leading into Jade's enchanting vocals as she rings out "86 thousand 400 seconds left," followed by Jade and Mats' harmonies singing, "What if we only were to live for a day, what if we only were one breath away;" they tell the story of how to live life to the fullest and enjoy the little things that make life special. Great lyrics and an arrangement that binds the music like a bow at the end of a knot. The use of close harmony on the song In The Cold Light Of Day creates a special folk-rock sound and Mats' vocals carry the song across an engaging arrangement. The title song Echoes & Rhymes is a haunting arrangement complementing the lyrics, "There is a silent rage that hides inside every breath, which's never been put into words ....you don't have to take the abuse." This is a song and an arrangement that stays with you long after it has ended; by far my favorite on the release. Paperplane is a folk-rock track that sparkles with Jade's voice and her ability to use phrasing to snap the lyrics to the arrangement. The track Ghost Town is a rhythm tight melody with lyrics that tease the eerie overtone of the arrangement; the track is inspiring, captivating, and interesting. Not Lonely - Alone takes the tempo to a pop-rock beat while Jade and Mats' harmonies are rich and entrancing. Live to Fight Another Day rocks the release with a driving melody and a powerful arrangement; Jade's vocals are commanding and she captures a message when she belts out, "We Live to Fight Another Day." The pace quickens with a fast stepping arrangement on How Big the Sky Is, more of those alluring Jade vocals, she shapes her voice around a musical note like a bespoke dress on a fashion model. Showing their diversity, the duo changes gears the track Tu Me Manques, a French ballad that Jade handles ‘très magnifique'. Other great tracks include I'm All Poison, an arrangement that has a Latin backbeat and cello snare drum baseline, Talk Is Cheap, a fun track with a catchy arrangement and Jade at her best as she carries the lead and ushers in another winning track. The release closes with Now Is a Place of Grace, a folksy song that brings the release together and provides that closure that has you feeling good, but wanting more. Read the Jade Ell - Interview in the Music Scene section. 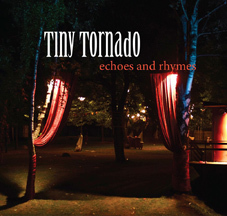 Websites where you can procure Tiny Tornado -Echoes and Rhymes are Amazon, eMusic, and iTunes. © April 2013. Luxury Experience. www.LuxuryExperience.com All rights reserved.